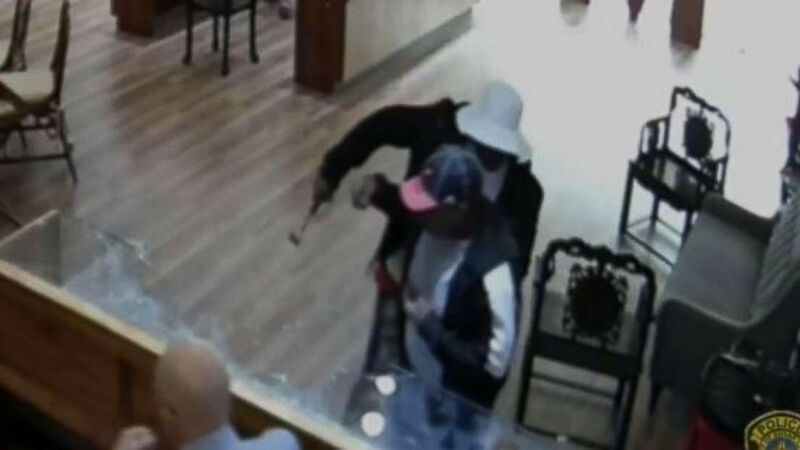 Two men bashed display cases and stole handfuls of jewelry in broad daylight. Police in suburban Houston are looking for two bandits who got away with more than $2 million worth of jewelry. The brazen smash-and-grab robbery on Jan. 10 was all captured on the store’s surveillance video. In the video from Hutton's Jewelry & Gifts, a man is seen asking a clerk about an engagement ring in a glass display case, according to Houston ABC station KTRK. The man next to him pulls out a hammer and quickly shatters the glass while the employee tries to avoid glass fragments. The first man grabs jewelry from the case as the other starts heading toward the door. Before leaving, he smashes a second display case with the hammer. His accomplice is seen taking items from that one too before fleeing. 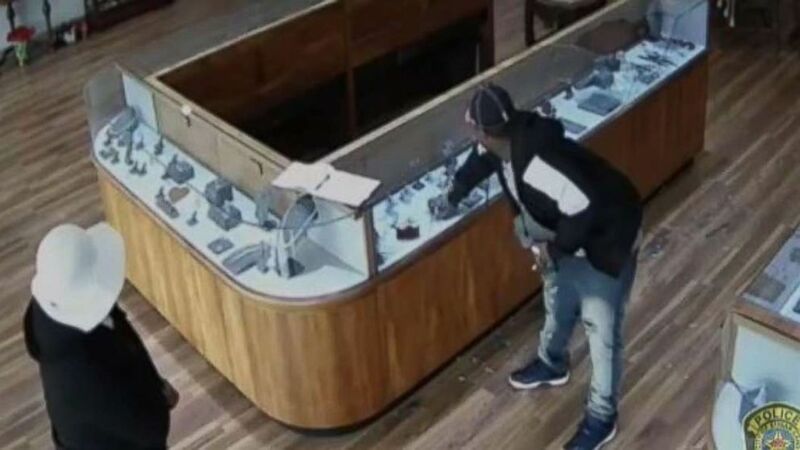 (Sugar Land Police Department) Two robbers made off with $2 million in jewelry from a Sugar Land, Texas, store on Jan. 10, 2018. According to police, the first suspect wore a black jacket with a red and black Chicago Bulls baseball cap and faded blue jeans. He is in his early 30s, about 200 pounds and stands about 5-foot-10. The suspect with the hammer appears to be wearing a white floppy bucket hat, black jacket and faded blue jeans. He weighs around 220 pounds and is 6-foot tall, police said. (Sugar Land Police Department) One man bashed display cases with a hammer, while the other made off with $2 million in jewelry from a Houston-area store on Jan. 10, 2018. In December, Houston police say that two men broke into Deutsch & Deutsch Jewelers before it opened for the day. Those robbers rappelled from a hole in the roof into the store. They got away by leaping from that store’s roof to another building in the River Oaks neighborhood. It was unknown if the robberies were related. “We have not connected our suspects to any other cases, but it’s a safe bet they’ve done this before,” Doug Adolph, Sugar Land City spokesperson, told ABC News. The Sugar Land Police Department has asked anyone with a tip to reach out to (281) 275-2540 or the Fort Bend County Crime Stoppers at (281) 342-TIPS.